I’m no Nicki Minaj fan. I am however a huge fan of OPI and this latest collection really catches my eye. The colours are amazing and just look at this promo image. I find that incredibly inspirational! It makes me want to get out my kit and try to recreate them all. I just think its amazing. So I was sent one shade from the collection to try out, Metallic 4 Life. Its small silver glitter and larger silver glitter in a black base. It is absolutely rammed with glitter which makes it quite gloopy, but that’s just how heavily glittered polishes are, it’s how it applies that matters and it applies perfectly. I would say for perfection you need three coats, I noticed one nail was a little sheer after taking the photographs, but I’ve done two anyway. It’s gorgeous. Sparkly and different. Love it! Each shade is £11 and available from www.lenawhite.co.uk NOW! At first glance this isn’t the most exciting of collections but to me it’s very autumnal and worth a close look. As a collection it’s not exciting to look at but in this day and age where nail polish seems to be all about effects and duochromes it’s good to remind ourselves that creme colours can rock! This is a twelve colour collection of which I have five to share with you. Starting with French Quarter For Your Thoughts. A pale to mid grey creme. I like this colour, I have a problem with grey polish, many don’t flatter my hands at all and make my fingers look extremely red, but this doesn’t. It’s lovely and I think I might do this one with a Cloud Konad stamp. A dark and dirty purple. I love it. I’ve not seen anything like it to be honest, but I’m not that well versed on all the polishes in the world. I just like this. It’s purple, but not as we know it. I should think this will be the most popular colour from the whole collection. It’s a bright coral with a very subtle shimmer. I don’t think it’s very Autumnal but I don’t have a problem with colours being seasonal really. I’m happy to wear black in the Summer and Lilac in winter. it’s a pretty colour. This a nice colour. A very subtle shimmer again and another coral, but softer and pink-er. Interestingly, in real life this and I eat Mainely Lobster bottles look very similar, but actually they’re not. It’s not the most exciting colour I know, but it is “nice” and a really nice colour for day to day wear I think. So that’s all the shades I have. All pictures above are two coats, no top coat and I found the application a breeze with all. Also, they dried very quickly. 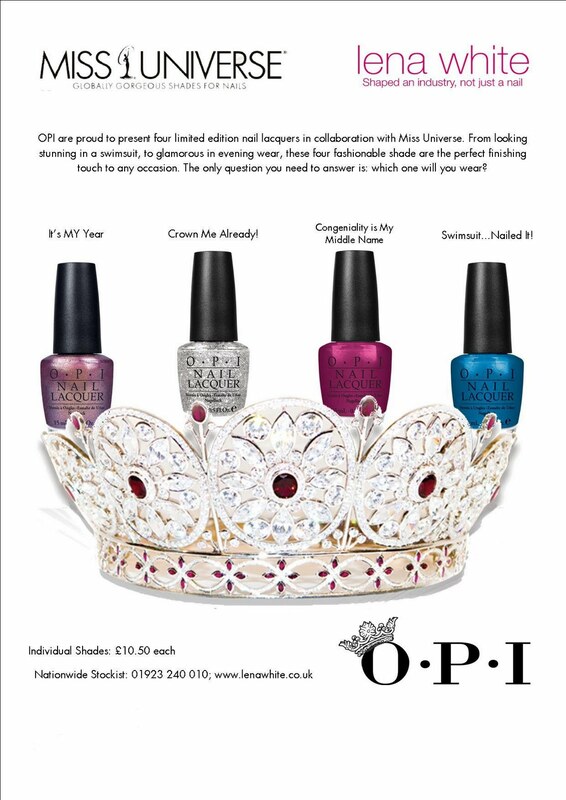 OPI Miss Universe – Swimsuit…Nailed It. This small collection looks really sweet and I have one I’ve got swatched here, Swimsuit…Nailed It! I’ve got three photo’s because I just couldn’t decide which was best. It’s a gorgeous bright blue. Full of shimmer, but it’s not frosty, it’s the right kind of shimmer. Lovely. I’m not a big fan of blues truth be told but I do like this one and I’m more likely to wear it on my toes. It’s very nice. Application was a dream but I needed three coats to get rid of the nail line. Dried quickly though, not th end of the world. Love the look of It’s MY Year and Congeniality is my Middle Name. Actually on reflection I do rather like the look of all of them! I’ve been looking forward to this collection for what seems like an eternity and a couple of weeks ago I was lucky enough to be sent a couple out to try. The shades I was sent to try are the Silver Shatter top coat and Stranger Tides, a fab looking murky grey/khaki shade. So first up is Stranger Tides. I love this colour! I found it slightly streaky, three coats is definitely better than two (there are two in the above pic) and I pretty much haven’t stopped wearing it since I got it. I remove it when it’s chipped and put it straight back on again. Virtually unheard of for me but my nails are quite short and damaged at the moment, worse than in the above picture and this is a nice colour that doesn’t draw too much attention to my fingers but definitely doesn’t feel boring. You may be looking at that picture above and be thinking it gives me terrible lobster fingers, but it doesn’t at all. My fingers are decidedly red because of the colour I’d just removed (as can be seen in the second picture down). I seem incapable of removing reds, shocking pinks and blues without leaving it all over my fingers. Anyway, I digress. Silver Shatter. I thought I was over shatter polishes to be honest but I love this! I think the two shades work together really well and I love it. It’s a more subtle effect that the Black Shatter and the formula is nicer too. So yeah, thats the polish I’ve been rocking for the last fortnight. Love it. The collection isn’t out yet but I plan to buy Mermaid’s Tears, Sparrow Me The Drama and Skull & Glossbones although I wouldn’t mind the others as well! I’ll be looking to see which are in the mini’s set when it’s released! I’m not sure of the exact release date but am sure it’s pretty imminent and will be available as always from http://www.lenawhite.co.uk/ at £10.50 each. I’ve mentioned a couple of times lately that I’m having a spot of nail varnish apathy, instead of being drawn to the rainbow of colours I own, I find myself drawn to nudes and french manicures. Not sure why, but as such one of the latest OPI launches, Femme De Cirque, is really calling my name. A small collection of 4 soft shades for Spring/Summer 2011 this won’t appeal to everyone but before you switch off I urge you to read on as I Juggle…Men is a must have by my reckoning! A very pale pink, this was three coats, fairly streaky but three coats is good enough for me and as I’ve mentioned I’m really into the nudey, less in your face look at the moment. I’ve yet to find a pale milky colour that isn’t streaky. But then we have the jewel in this collections crown. I Juggle men. A sheer base rammed with tiny iridescent particles, mostly blue on the nails but also flecks of pinky purple. It is so stunning. In the bottle the pinky purple is the dominated shade. This is so pretty and right up my street, this is my prefered way of wearing I Juggle Men. However, if this isn’t your thing then don’t turn away yet, because you need to see this layered over black for the full impact. I give you I Juggle Men over China Glaze’s Liquid Leather. If this collection takes your fancy it’ll be out soon from http://www.lenawhite.co.uk/ as usual. OPI Nail Apps. I saw these over at http://www.lenawhite.co.uk/ a week or two ago and I must say the certainly piqued my interest. 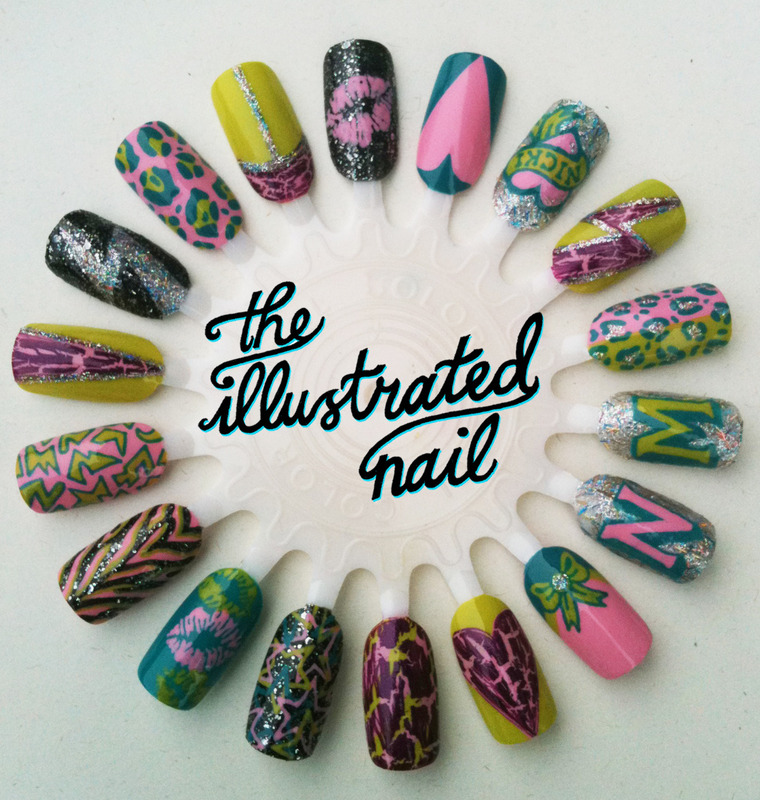 Nail Apps apparently make nail art easy and come in 12 designs. You choose the sizes closest to your nail sizes, trim the width if necessary, rub to warm the stickers and then smooth onto clean dry nails, filing off the excess. Sounds simple! I’m loving the look of Skulls, Tigress, Steps, Magic Garden, Jump and Crazy Daisy. They look gorgeous and they are available now (http://www.lenawhite.co.uk/). My only reservation is that they are £13.80 per pack and claim to last 1-2 days when applied properly which seems very expensive for something so temporary. I think curiosity will get the better of me though and if I do cave in and get some I’ll report back on what they are like, but at that price they’d better be amazing! As you probably know if you are a regular reader, back in November I was sent OPI Not Like The Movies from the Katy Perry Collection and the Black Shatter Top Coat for review purposes. I absolutely loved the combination (review here) and wanted to get the rest of the polishes from the Katy Perry Collection too to layer with black Shatter. I picked them up for about a tenner from Ebay. Very sparkly, very sheer, very pretty but nothing like the blue in the bottle. A beautiful colour on its own but I hate it with Black Shatter over it. I think it looks cheap and nasty. It seems I only like Black Shatter over pale shades. Very pink and very sparkly, sheer, but not as sheer as Last Friday Night. Nice colours individually but I would absolutely NOT recommend this set of mini’s. I have no issues with the tiny lids and brushes, I still managed to get good applications from them, and generally I do recommend the mini sets as great ways to try collections out, but in this case, two of the mini’s are glitters, glitters that are quite thick and take two coats, which means that after one manicure the bottles are substantially emptier. If you fancy these colours buy full size bottles! I really love Not Like The Movies and will probably get some use from Last Friday Night as a layering glitter. The OPI Texas Collection is due out in February and is the Spring/Summer Collection for 2011 and as yet I’ve yet to see much in the way of hype about it, in fact I’m sensing more of a collective snore… I suppose at first glance the collection does appear to be a rather uninspiring collection of cremes and frosts. I am fortunate enough to have been sent six shades (from the full collecction of 12) to have a closer look at and I urge you to consider taking a second look, there are some cracking colours and whilst I may not have chosen them, several caused me to sigh happily whilst gazing at my pretty fingers. So without further ado, lets take a closer look at the shades I was sent. I ADORE this. It’s nothing fancy, in fact it’s a little sheer, and in the pictures there are three coats, but it’s a glorious pink. It’s ever so slightly muted, but bright too (which I realise sounds like a contradiction but it’s why I’ve shared both of the above pics). I’m told (but haven’t tried) that if you pop a coat of white on as a base, the sheer polishes work very well. However, three coats of this was perfect for me and didn’t take an eternity to dry. I can see me getting a lot of wear of this when the sunshine finally arrives! Another sheer one, this three coats. A glorious greeny blue. Whether it’s more blue or more green depends entirely on the light you’re in at that time. But the reason I urge you to take a look at this one is that there’s PINK shimmer, it’s subtle but it’s there and it lits this polish out of the ordinary. Don’t try looking for pink in the pics, I failed miserably to capture it! The only real disappointment of the lot. It’s a beautiful beautiful colour and I really adore the colour. Palest blue and colour wise it’s my favourite of the lot. BUT the formula is awful. It is so streaky and I had to keep adding more layers to try and even out the streaks, so in these pics this is three thick coats and even with a topping of Seche Vite it still took forever to dry and it’s still streaky. Very disappointing. Even now as I scroll through this post this is the colour I love most, but its such hard work. You should have seenthe state of my other hand it was a real mess! It’s a coral jelly and therefore it’s sheer. Obviously you can see my nail line clearly through the polish and I know that will instantly repel some people. However I remind you of the white base coat trick but I quite like this. It’s bright and I think in Summer especially this would be super hot, especially if you are the bronzed goddess type! My surprise favourite of the lot! It’s a bright green creme finish, but it’s got that muted effect I love so much that stops it from being too bright for me. A total surprise because I don’t like Greens on me generally, but I’m going to get loads of wear out of this. Smooth and virtually opaque in one coat. Gorgeous. The last one I have to show you! It’s Totally Fort Worth It is really hard to describe. It’s a pale grey that looks to be tinged with lilac. Just a smidge. But what makes this special is that it’s full of pink sparkle. The sparkle is very subtle and I’d love it if it was a bit more prominent but it’s there and it’s really pretty. It gives the overall colour an air of something you can’t explain. An overall hint of pinkness rather than obvious sparkle. Again, it’s very sheer and this is three coats, but its a lovely formula and not thick at all so those three coats dry quickly enough. So thats it, any of those catch your eye? I do believe that with these shades pictures don’t really do them justice, they are so much more effective in the flesh.